The December 2012 issue of National Geographic magazine has a fascinating article called “Masters of Ecstasy” by David Stern on mystical priests, practitioners of intervening between the seen and the unseen in matters of money, health, the future, and the past. These are the shamans of various ethnic traditions of Mongolia, Central Asia, and Siberia. The article tells the story of how these ancient traditions are seeing a strong revival following the downfall of atheistic communist regimes that fell like dominos nearly 25 years ago with the breakup of the former Soviet Union. Shamanistic traditions evolved in what is now Siberia and spread throughout the world thousands of years ago. Suppressed by Christian, Islamic and Buddhist religions, then by communist governments, their traditions went underground for centuries. Now shamans openly practice in north and Central Asia. Many work alone while others have organized, like the 10,000-member-strong trade union at the Golomt Center for Shamanic Studies in Ulaanbaatar, Mongolia’s capital. The word shaman comes from a Siberian people known as the Evenki. Santa Claus is a shaman. This is the backdrop, the canvas that begins to paint of the visual depiction of the origins of the personage that has morphed into the modern American concept of Santa Claus. One of the elements adopted in various Western European countries is celebration of a monk named St. Nicholas, who was born into wealth in Patara, in modern-day Turkey around 280 A.D. St. Nicholas, known for helping the poor and sick, celebrated for his kindness and generosity on his feast day of December 6. He was seen as a protector of sailors and children. The veneration of St. Nicholas, the most popular saint of Renaissance Europe, survived through Dutch traditions. Gift giving for children, and the tradition of Christmas shopping were promoted with in newspapers advertisements in the 1820s, and by the 1840s, separate advertisement sections for Christmas shoppers appeared. In 1822, an Episcopal minister, Clement Clarke Moore, wrote a long poem for his three daughters called “An Account of a Visit from St. Nicholas”. Initially the poem was not meant for public consumption, but once published it became the iconic “’Twas the Night Before Christmas.” It introduced the concept of the “right jolly old elf” with a red suit, lined with white fur, knee-high black boots, rolled down at the top, and the magical ability to descend chimneys and deliver presents on a sleigh led by eight flying reindeer. Still with me? We don’t know what sources Clement Clarke Moore drew upon to create his fanciful vision of Santa Claus. A 2012-2013 exhibit at the Lloyd Library and Museum in Cincinnati informed us of possible influences. The exhibit, “What Makes Reindeer Fly?” was devoted to the role of mushrooms, particularly the Fly Agaric (Amanita muscaria) in cultural traditions. The Fly Agaric is the most iconic of all mushrooms. Its bright red cap, dotted with white cottony spots, is depicted in children’s books such as Alice-in-Wonderland, children’s toys, and even yard ornaments. In Clement Clarke Moore’s day in the early nineteenth century up to the creation of steam pleasure ships, such as the Titanic, readers experienced the world by reading travel literature. One book featured in the Lloyd Library and Museum’s exhibit by English naturalist Aubyn Trevor-Battye is “Ice-Bound on Kolguev” (1895). Kolguev is a 1900-square mile island in the Barents Sea, at 69 degrees north latitude. In other words its climate is Arctic. Home to an indigenous tribe once called the Samoyed people, today they are properly known as the Nenets. In Trevor-Battye’s day they were nomads whose economy was entirely dependent upon reindeer for food, clothing, shelter, and mobility. Trevor-Battye planned a month-long birding trip to the Island in July of 1894. Arctic ice blocked passage of boats, so his month-long expedition turned into a year’s journey. He described the reindeer as fleet-of-foot, and when crossing a snow-packed ravine at a gallop, the Nenets’ reindeer-drawn sleds would literally become airborne. 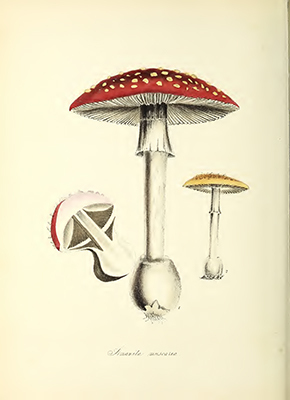 Amanita muscaria, plate 79 from Burnett, M. A. and G. T. Burnett (1847). Plantæ utiliores Vol. 3. Shamans of the Nenets (and other nomadic indigenous tribes of northern Europe) wore red-dyed reindeer coats, with white fur trim along the bottom, neck, and sleeve edges. High black reindeer skin boots, rolled down at the top were their footwear. Today the Nenets wear rubber boots of the same design. Their red caps were also trimmed with white fur. The colors honor their sacred mushroom the Fly Agaric. The Nenets nomadic dwellings, a cross between a teepee and a yurt, called a “choom” had an open smoke hole at the top. During summer months, Nenets shamans collected the red and white Fly Agaric mushrooms. They dried them, and during the deep snow of winter, shared them with the community, entering the choom through the “chimney” hole at the top. They also shared the mushrooms with their reindeer herds, who relished them and would prance and jump under their influence. Inspired by the good deeds and benevolence of the second century saint, St. Nicholas, and obscure travel literature that described the shamans and material cultures of ancient indigenous tribes of Arctic Europe, give use the vision of Santa Claus that we know today, transformed into reality by the best traditions of American writers peppered with a high dose of American commerce. I know for a fact that Santa Claus is real. As an eight-year-old, on Christmas eve, awake in my bed in an old house in Maine with a snow-covered roof, I am positive, beyond a shadow of a doubt, that I heard Santa’s sleigh land on the roof. I will never forget the sound of the sleigh bells jingling as he took off. Top image caption: A Nenets (Samoyed) man throwing a di-zha (lasso) to capture reindeer. Reproduced from Ice-bound on Kolguev: A Chapter in the Exploration of Arctic Europe to Which is Added a Record of the Natural History of the Island by Aubyn Trevor-Battye, published in Westminster by Archibald Constable and Company, 1895. Next Next post: Medicinal Plant Workshop, June 17-23 | Sign-up!